I have loved Oscar Wilde since I first read The Selfish Giant, at 13. He has a very special place in my heart. It's not uncommon for me to be caught in a daydream, and be thinking of Oscar, one of his stories, what it would be like to sit and talk to him. The Selfish Giant, written for children, is one of my favorite Oscar stories. My piece was inspired by The Selfish Giant, made to honor Mr. Oscar Wilde... a man who has given me endless hours of dreaming. 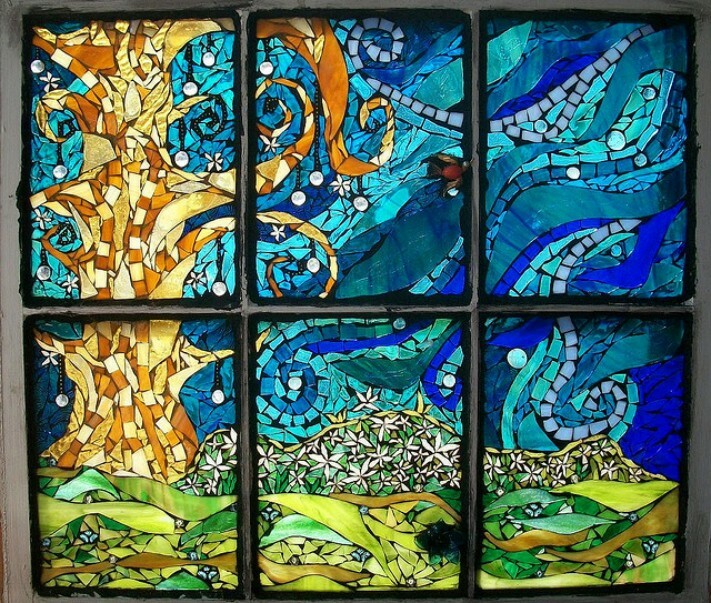 This piece won first place in the "Dream a Little Dream" PieceMaker Mosaic Challenge. The window frame was salvaged from an old farm house here in Maine.